Boy, people sure do love lists. Since publishing the “best dishes of 2008,” I’ve received numerous emails inquiring about my best restaurant meals of 2008. As I said in that post, this year I have been blessed with many very good meals. But a few float to the top more readily than the others. In ordering this list, I struggled with focusing on the food, service, and setting of the meal (i.e. those qualities attributable to the restaurant) devoid of personal context (i.e. company and personal mood). But separating the two, as you can appreciate, was impossible. As I have insisted again and again, the eating experience is a highly personal and circumstantial one. Not one restaurant experience this year was entirely flawless. But quite a few were priceless. I present them – the meals that made the most lasting impression on me – to you here, along with some other restaurant “bests” of 2008. Click on each restaurant to read my review, if one exists, and/or to see the photos from that meal. I need not elaborate. Click on the link. My dinner at Le Bernardin in June made me want to re-prioritize life. Focused and honest, this restaurant demonstrates how food should be treated. Aquavit proved that I have Scandinavian blood in me. I found Marcus Samuelsson’s food a compelling and successful take on Swedish cuisine. It hit all the right spots. Awesome food – smoked eel, sweet langoustines, and a mighty fine ham and spaghetti dish – and great bread to boot. Ledoyen was a truly memorable meal. I’m partial to the Austro-Germanic influences in the cuisine of the Friuli Venezia Giulia region of Italy. Chef Mackinnon-Patterson presents this region’s sensibilities with finesse. The service here also made the experience unforgettable. Guy Savoy is a party I won’t soon forget. The experience was as colorful as the restaurant. The food was as delightful as the service. Who knew three-star eating could be this fun! This meal had an unfair advantage: black truffles. From top to bottom, black truffles were shaved, infused, sandwiched between, and scattered over everything we ate. And all of it was done with confidence and success. Exciting antipasti, incredible pastas, and wonderful fish and meat, vetri ristorante and Marc Vetri’s food is full of soul and story – the product of il viaggio for sure. You can’t argue with twenty-plus courses of perfection. There’s something terribly refreshing about breezing into an eatery without reservations and shorts and sandals on. The grub here ain’t bad either. The following are more for my own personal record than for any formal publication. But, I offer it for your consideration. It’s no surprise that many of the following overlap with the entries on the list above. After a chilly reception three years ago, le Cinq welcomed my guests and me with generous and gracious arms. What happened? Did George V abdicate his throne to me? I didn’t ask, I just enjoyed. Professional, efficient, and warm, my first night with the staff at frasca food and wine felt like the hundredth night at frasca food and wine. It takes one mighty fine and talented crew of servers to not make a diner feel self-conscious about having his mind read. The staff at Jean Georges anticipated my every thought and wish. It was uncanny but not unsettling. * I recuse Guy Savoy and Eleven Madison Park from this list, as I was either with people who are good friends of the house, or I am known to the house. Both of these restaurants have excellent service. I’m really ill-equipped to be making any pronouncements on the topic of wine. But here are the five sips that did the most to redefine food and wine for me this year. Le Chemin Vieux Cuvée du Petit César paired with roast organic duck with sweated scallions. Borgogne Domaine Leflaive (2006) paired with brown crab risotto. M. Sorrel Hermitage, Rhone Valley, France (2004) paired with Nova Scotia lobster poached with wild nettles and morels. Meursault “Les Tillets” (2006) paired with shrimp ravioli with foie gras sauce. I’m not usually a dough fiend, but I discovered some excellent irresistible bread this year. Like good service, good bread is inexplicably rare in restaurants. Not surprisingly – and sadly – my three favorite examples were in Europe. 1. Pavillion Ledoyen (Paris, France) Buns studded with speck and burnished brioche coated in sesame, the selection here was mind-bogglingly good. I need to get the recipe for their squid ink and prawn roll. The light, fluffy focaccia and velvety soda bread here really can’t be beat. The bread at le Bristol is my type of bread – the kind with a much higher crust to crumb ratio. Crunchy batons studded with olives, crispy rolls laced with seaweed, and a thick-skinned loaf chock-a-block with nuts and raisins just for the cheese course, I had little trouble carb loading here. I hesitated to make this list, knowing that taste in décor and ambiance is a highly personal one. But, I ate in some pretty fantastic-looking restaurants this year, and I’d be remiss if I didn’t mention them. Please, feel free to voice your disagreement. One had better enjoy the tapestries, marble, and velvet in this temple – one is paying dearly to sit amongst it all. l’Ambroisie is austere elegance. The gigantic head of Buddha stares at you from glass case on one wall. Wooden carvings from Africa grace the ledges. It’s eclectic. It’s modern. It’s a circus. It’s a party. Many disagree with me, I know. 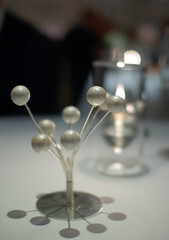 But I find Eleven Madison Park’s lofty art deco interior absolutely thrilling. I could sit there for hours just soaking it all in. First impressions are always the most important. These three restaurants sent out incredibly hard acts to follow – even before the first act. A fine Comte gougere (the size of one’s head) and a cup of velvety pumpkin soup topped with truffled whipped cream, Paul Bocuse understands that an appetite opener doesn’t have be fancy or novel, it just has to be good. Eric Briffard sends out the most fragrant and alluring basket of battered and fried shrimp I’ve ever had as the opening volley. The shot of lobster in lemongrass-mushroom broth with lobster foam served as an amuse bouche at Le Bernardin made me wonder how the meal could possible get any better from there. It didn’t, of course, it was just as good, course after course. No one ever wants to the party to end. These restaurants did their best to make sure the afterglow was bright and memorable. I’ve seen my good share of dessert trolleys in my life. But I’ve never seen one like the one at Guy Savoy. After dessert, we were presented with chariot loaded with the most magnificent and breath-taking selection of confections: tins of sorbets and ice creams, jars of marshmallows, bowls brimming with macarons, torts, tarts, and containers boasting creams and curds. Trees sprouting milk chocolate fruits, cold Turkish delight, a phosphorescing tray of white chocolate truffles filled with strawberry ice cream, and – just because Christmas was within sight – mincemeat pie and egg nog. The petits fours at Gordon Ramsay at Royal Hospital Road take you back to childhood; they’re whimsical and magical. Smother them with excess. The party here goes on, and on, and on…. and on. And just when you think its over, it goes on for a little more while. And it continues onto the next day, when you eat your famous take-away macarons. ~ by ulterior epicure on January 4, 2009. We’re heading there this Summer and still thinking whether to put Michel Rostang or Plaza Athenee in out itinerary. As for Paul Bocuse, I want to read what you think of it. I personally think more establishment should be as generous and festive as this one. The cuisine are for the most part, taken out of “nouvelle” cuisine textbook and perhaps hasn’t changed much since. In the days where 3-Stars French Chefs are cooking with coriander, lemongrass, fenugreek and nori, I find Paul Bocuse a true blue and destination worth going. It felt like home.